Winding down for the evening with children requires a routine; they need it and they love it. 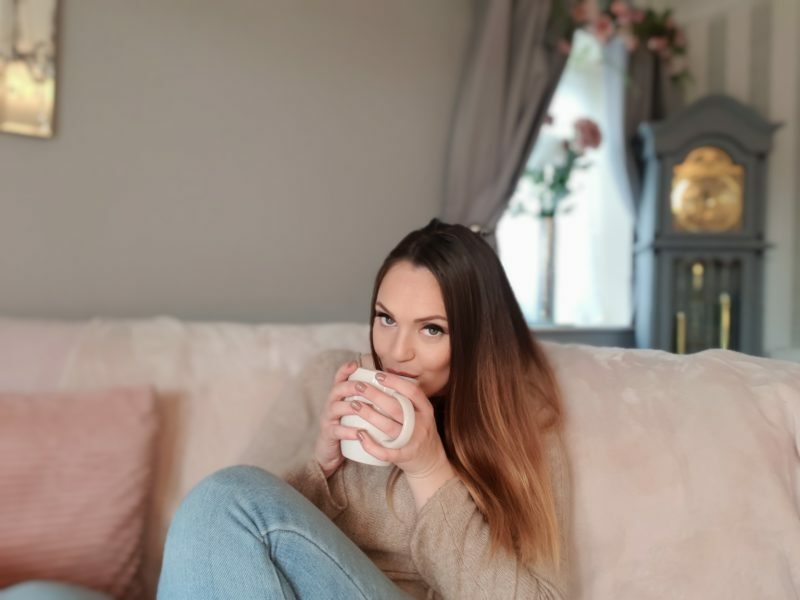 Here in the Knight Tribe’s home we stick to the routine come rain or shine, even in the school holidays. 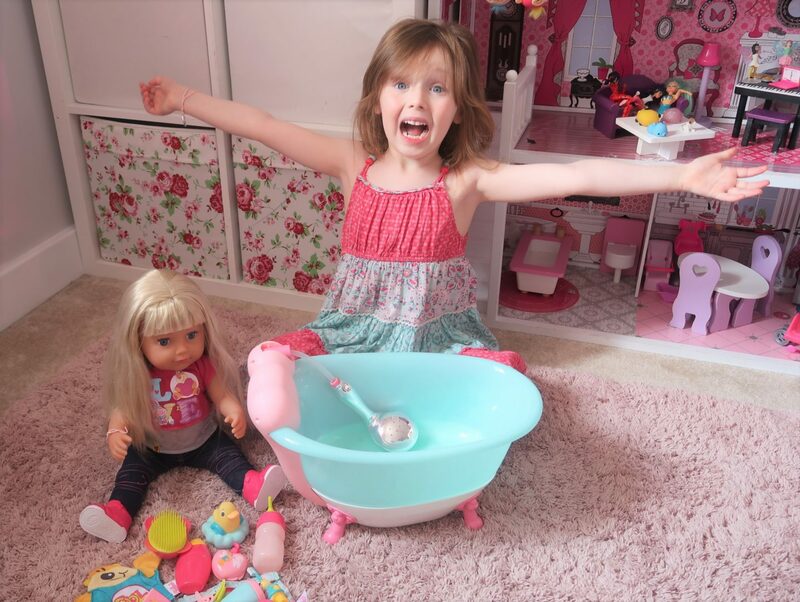 This time we have someone new to share it with, in the form of a doll, with her bathtub and her accessories. Meet Isla (Emily named her after her BFF). She is from the Baby born range and stands 43 cm tall. She is the same height as Baby born so she can share her clothes and accessories for lots of Baby born fun. She also comes with 10 accessories including scrunchies, necklaces, a hairbrush and her own sippy cup. You can move her arms and legs, she can stand up on her own, she drinks water from her sippy cup, she can cry real tears, she is bathable and does not require any batteries which is always a bonus. We received the new Baby born bathtub with an automatic shower to help us with our nighttime routine. 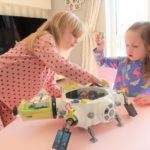 There’s loads of bath time fun to be had for Baby born. The Baby born Bathtub features an automatic shower function, unique lights and sound effects. Press the button and the base of the tub lights up in all sorts of colours and bathing sounds play while water pours from the shower head. Suitable for dolls up to 43cm, the bath also comes with BABY born’s favourite bath time rubber duck. Don’t worry about getting her hair wet because as long as you are using lukewarm water it will dry naturally ready to be brushed and styled. She has synthetic hair so do not use any heat on her otherwise you will ruin her hair. Now bath time is over and Emily needed to get Isla out quickly before she cries because she is too cold, just like Emily does. We were too late and she had already started to cry. 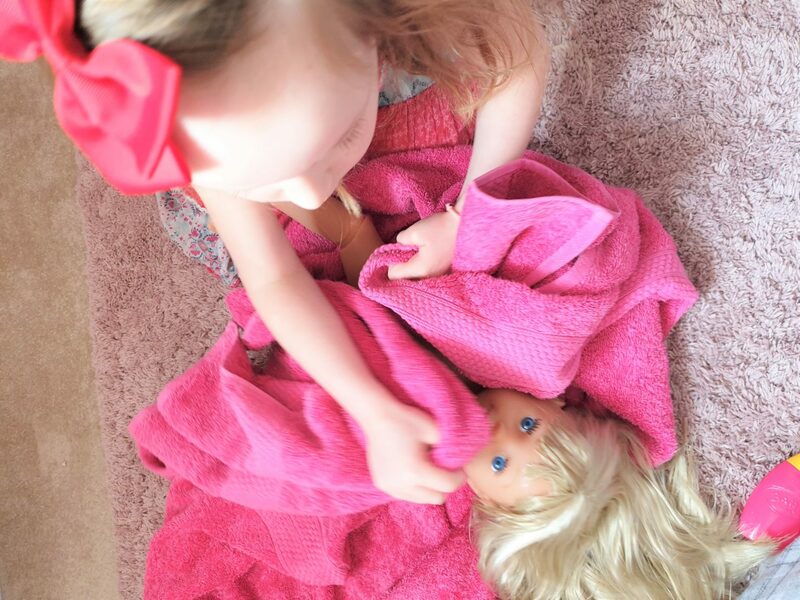 Emily worked as quick as she could to dry her doll fast so she would stop crying and it worked. We also received a Baby born bath wash and go set with lots of different items needed for bedtime. After Emily had finished creaming and powdering her doll it was now time to brush both of their teeth. In our house, after we have brushed out teeth it’s time for bed. 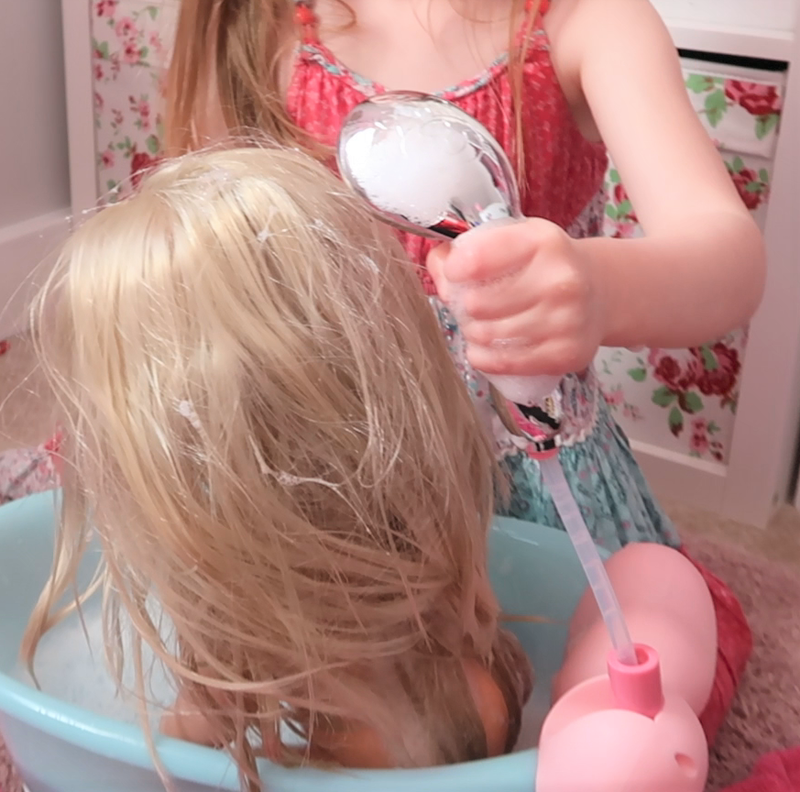 We have really enjoyed showing you our bedtime routine with our new Baby born sister doll and interactive bath. Overall this is great. Emily has taken her everywhere. 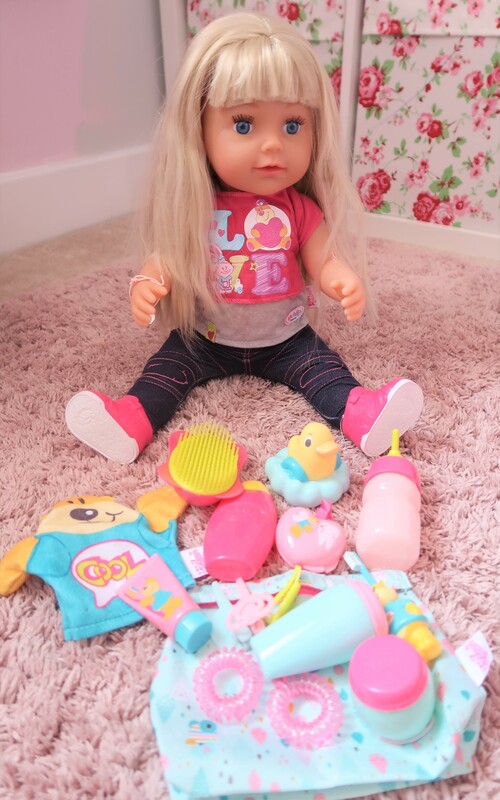 She loves playing with her hair which surprisingly doesn’t get very knotty, as other doll’s hair does. She didn’t like that the dolls eyes didn’t close when she was laying down but this didn’t seem to bother her too much now. We love that she can stand up on her own and that she’s not a ‘baby’ baby. The bathtub is so much fun with the sound effects, rainbow lights and bubbles. There is a button on the front of the bath which you press and the shower will automatically turn on so no pumping is required like the older model and you can stop the shower by simply pressing the button again. The shower head also comes away from the stand a little bit like a normal shower does which is pretty cool.